Phil Bland started out as a geologist, and pretty much got into meteorites by chance. It’s not something he’s ever regretted. He has interests in many areas in planetary science, but mainly in trying to understand the record of the origin and evolution of the solar system contained in ancient meteorites. The comparison he makes is with geology in the late 1950’s. Plate tectonics – geology’s grand unifying theory – was just around the corner, but no-one knew it. All they had was a lot of data that didn’t really fit together very well. Planetary science today is at a similar point. We know how the Earth works, but we don’t know how it was made. The idea behind the Desert Fireball Network is really just basic geology – you need to know where rocks come from in order to understand them. The possibility that if we get this data for meteorites, that that might be a big part of the puzzle, is something he finds really exciting. Phil has worked at a bunch of places, most recently Imperial College London. He spent many years trying to get funding for the trial phase of the Desert Fireball Network. After proving that the concept worked, Phil started at Curtin in May 2012 with funding from an ARC Laureate Fellowship and Curtin University to expand the network across Australia. The Desert Fireball Network team will be spending the next few years doing just that, and sharing what they’re doing with you. 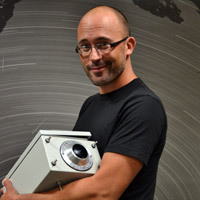 Phil shows off one of the new digital cameras ready to be installed in the Desert Fireball Network.